Or so the ranger told me as I went to get my ticket for the cave. I knew the weather wasn’t great, but I hadn’t thought about it obscuring the mountain. I was one of the few people who came specifically to Wind Cave that morning. When I walked in only one man was in line, but he was buying tickets for him, his wife, and three kids. His five tickets were, in fact, the last five tickets sold for the 10:30AM tour that day. Upon seeing me there alone, looking for only one ticket with no one else in line behind me to turn away, the ranger at the counter formed a look of pity. She turned to the man behind her, who was focused on the radios at the desk. “It’s your tour, could we do one more?” she asked him. “I won’t tell anyone,” he said nonchalantly. I was in. Wind Cave National Park is located about 30 miles south of Mount Rushmore, and most of its visitors haven’t heard of it before. Local native tribes (specifically the Sioux and the Cheyenne) always knew of the cave’s existence, and some even considered it a sacred gateway to the underworld. But the first evidence of any human venturing inside was in 1881, when Tom and Jesse Bingham happened upon a rushing noise coming from a hole in the ground. Upon closer inspection, the wind from the cave opening blew the hat right off of Tom’s head. The largest natural entrance to Wind Cave is only about a foot across, and it’s mind boggling to imagine any human thinking it was a good idea to try to fit inside. It’s one of the ways in which the natives were smarter than the white man, I suppose. 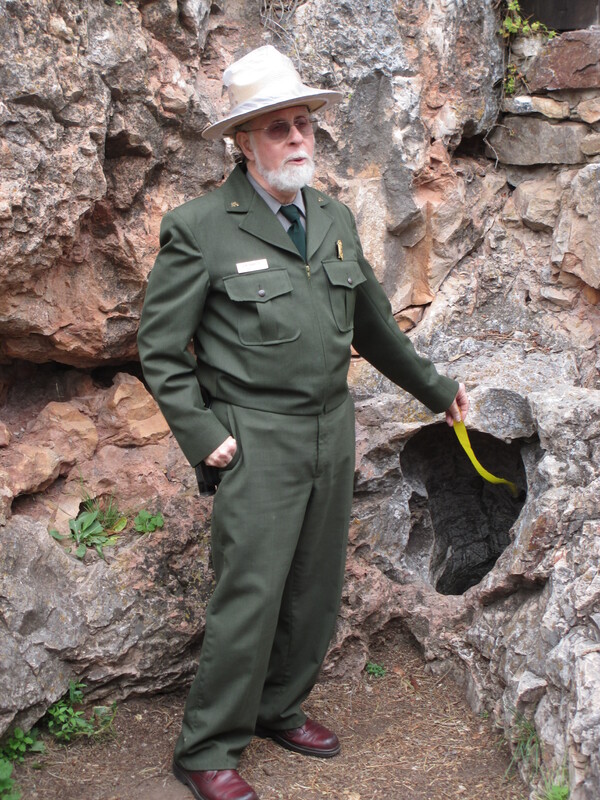 On our tour the ranger took us over to this entrance and pulled a bright yellow ribbon out of his pocket. He held it up and the ribbon hung limply from his fingers. As he brought it towards the opening, the ribbon instantly shot towards the hole, the wind sucking it into the cave. The ranger explained that the phenomenon is a result of the difference in barometric pressure. Like most caves, the interior of Wind Cave is a fairly constant temperature, regardless of outside conditions. When the weather outside is warm, the difference in pressure causes a wind that rushes into the cave. When the weather is cold, as it must have been the day Tom and Jesse stopped by, the wind blows outward. 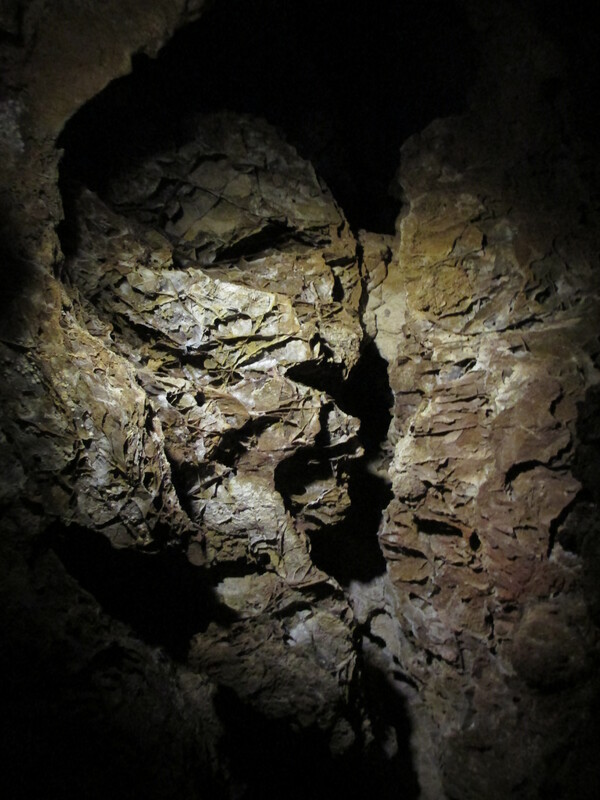 In theory most caves experience this change in barometric pressure, but the strong wind only happens when the change is squeezed through a small opening. This simple and fascinating scientific fact has been very helpful in my regular life, allowing my office mates and I to understand why our reception desk gets so cold whenever people shut the door to the conference room. Wind Cave has a few other claims to fame. For one, it’s the sixth longest cave in the world, though only a tiny portion is wide enough for humans to walk through. 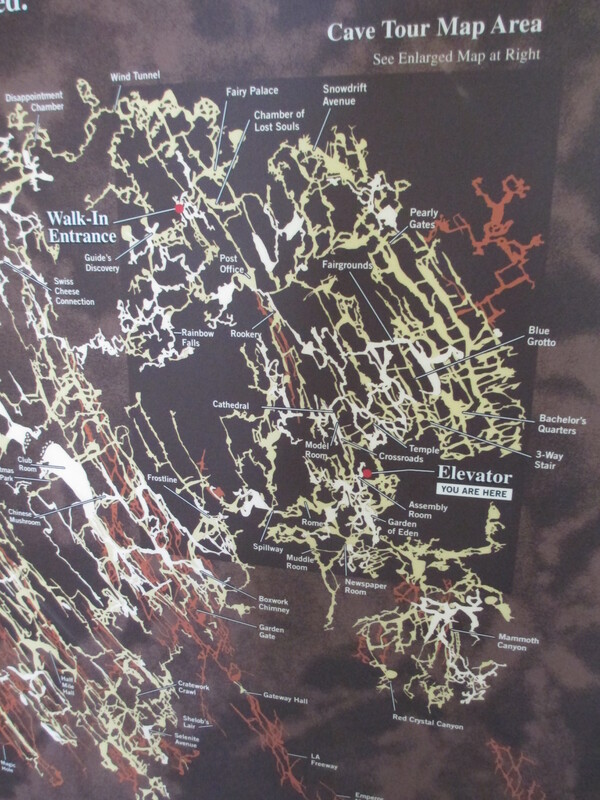 Even in the public section, the passages in the cave are often extremely narrow. I found myself feeling the squeeze in a few sections, and I’m not a very large individual. Secondly, it’s the largest concentration of boxwork formations in the world. 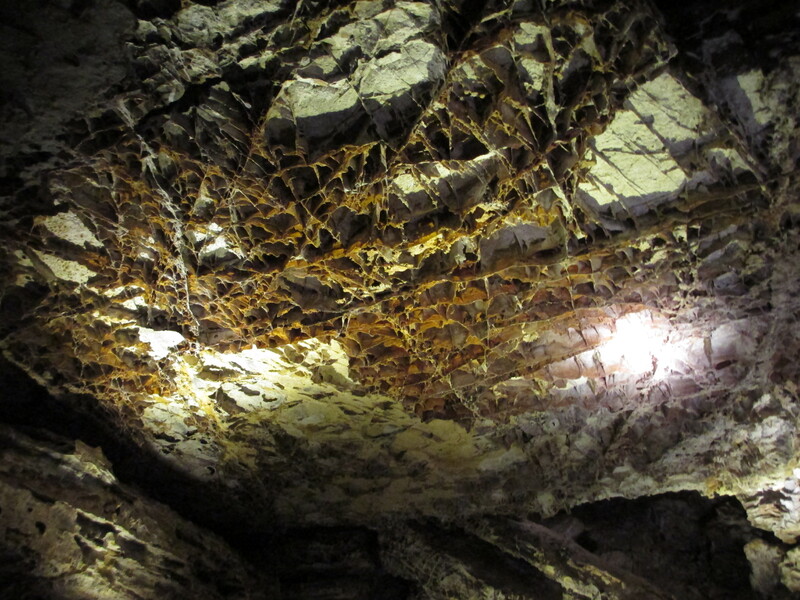 More specifically, 95% of the world’s known boxwork is found in Wind Cave. To understand boxwork, imagine you were building a wall with empty milk cartons for bricks and regular cement for mortar. Imagine you then wait several years for the milk cartons to slowly fall apart and rot away. What you have left is the cement, formed into thin walls around the empty spaces, looking a bit like a honeycomb. This is how boxwork is formed. Strong calcite fills in the cracks between the normal rock, and over thousands of years the rock erodes away and the calcite remains. The walls of Wind Cave are full of these honeycombs. They look fragile, like they’re made of cardboard. The main tourist path through Wind Cave was built in the 1930s. If there’s one thing traveling the country taught me, it’s that the Works Progress Administration got things done. Depression-era workers built roads and bridges all over this country, and occasionally they built them in caves. Just imagine being a labor worker in the United States in the 1930s, with the kind of technology available. Imagine navigating some of the narrowest passageways you’ve ever seen, pouring concrete by candlelight, and looking up to see rocks as thin as paper lining the walls. It sounds awful and wonderous, but at least we all can benefit from their work. I’m glad so many tours at Wind Cave are sold out, and so many people come to visit. Even if it is just because they can’t see the faces on the mountain. This entry was posted in Attractions, Nature. Bookmark the permalink. It really is pretty amazing to think of all the places that the WPA worked, and all that they did. Neat cave!